This 2AA light from Fenix measures 6.1-inches long and features side-mode switches that control four brightness levels and two flashing options. It uses the Cree XP-G2 (R5) LED that has a lifespan of 50,000 hours. The anti-roll, slip-resistant body is constructed from durable aircraft-grade aluminum. 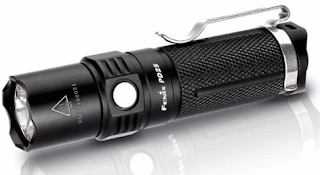 Used exclusively in the outdoors or to assist with everyday needs, the PD25 is capable of producing a maximum of 550 lumens for its 427-foot beam distance, generated from a 16340 rechargeable Li-ion battery. Utilizing the Cree-XP-L-V5 LED, lifespan of 50,000 hours is impressive. The tactical tail cap switch has a momentary-on feature, coupled with a side-switch on the head for output selection. Its toughened ultra-clear glass lens has anti-reflective coating and is built to last. The HL50 Headlamp brightly shines 365 lumens in burst-mode and uses a CR123A battery or an AA battery as a backup. Its natural, white light offers superior definition and penetration capabilities in high-humidity environments. You can even pop the lighting head out for hand-held or keychain use, which makes this light extra versatile. Check out all of our Fenix lights on TheFireStore.